As we step into the New Year, it’s time to dust off the predictions and the analysis of 2013 crystal ball and take a look at what we can expect in 2014. Generally, there will be extra focus on 2 big areas, video and younger audiences. Although like the last year, this year too, no forecast is 100% certain, yet there are certain items that will look pretty clear. Are you aware of the ways in which you can utilize the aforementioned areas in order to grow your online audience? This is the cloudy part of the predictions and hence you certainly need help. Have a look at what you might expect from some of your favorite platforms in 2014. 1. Facebook: When it comes to Facebook, you can look for video ads to get the prime focus. Although Facebook has started testing these, yet they certainly expect a wider rollout. But unfortunately its only time that can tell whether the public will entertain such ads. There will also be an effort to keep the younger generation more engaged in this platform. Can you believe that Facebook is presently facing a crisis as a large number of young users are dropping the platform? In fact, the younger generation has become more interested in photo-centric platforms and this might be a good clue to the fact where Facebook may go to the next level. 2. Twitter: More specific ads and more photos. It is indeed not possible to say much in 140 characters but Twitter believes that you could say a lot more through photos. In fact, it has been seen that this platform has gradually become much more visual over the last few months and this trend may continue throughout the New Year. The business firms will have more than one ways of reaching out to their audiences in every specific ways in 2014. 3. 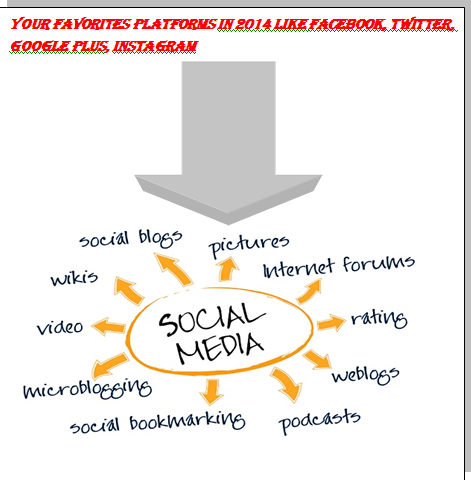 Google+: Google+ is one of the most important social networking websites in a well-balanced social media plan. Now suddenly, since the last quarter of 2014, people have started believing that Google+ is extremely important when it comes to good SEO. If you still don’t have a Google+ account, you can get one as soon as possible. 4. Instagram: Yes, this is one of the unanimously acknowledged darlings of social media among the consumers, businesses, both the young and the old. In 2014, you can look forward to Instagram continuing to innovate, especially around the advertisements that are relatively new within the Instagram platform. Instagram requires making money but not alienate and detach their audiences who enjoy using Instagram. Therefore, with the social media, you should never expect out of the blue as situations may happen that can add water to all your expectations and on the other hand, all your expectations may become true. Get in touch with a social media expert who can advise you on the steps that you can take in order to create your niche in the social media industry.